The 9th BFA U-15 Baseball Championship will start at the Shida Stadium commanding magnificent view of Mt. Fuji on November 1. Six teams from Asia will join the 5 days’ single round robin contest: Chinese Taipei, Hong Kong, Korea, Pakistan, Philippines, and host Japan. 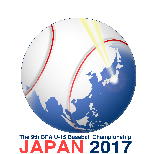 One of the features of the U-15 Asian Championships is the use of BFA approved rubber ball n “Kenko World M”, instead of regular hard ball. With the same size and weight as hard ball, its impact is about 1/3 of hard ball making it much safer to play for junior players of growing stage, especially during transitional period from playing rubber ball to hard ball. Another advantage includes economy as the rubber ball is more durable and can be used in in wet or rainy conditions. Japan KWB Baseball Federation, a main promoter, hosts National Championships of Juniors and Girls Junior every year participated by about 500 teams from across Japan. President Tsutomu Shida (83) of Japan KWB Baseball Federation says that this international competition provides opportunity of developing KWB Baseball globally by giving children confidence, reducing their anxiety and allowing them to fully focus and involve themselves in the game. Chinese Taipei have captured 3 consecutive Asian title (2010 in Bangkok, Thailand, 2012 in Orissa, India and 2015 in Shizuoka, Japan), sending Japan and Korea in 2nd and 3rd places respectively for the third time in a row also.